Of course there’s nothing better than getting a professional facial, but they are so pricey! A normal, basic facial costs about NZ$60 and that's just cleansing, exfoliating and hydrating just like my own DIY facials you know. No extraction is done and the procedure takes about 45 brief minutes. Crazy right? There's more to this. A hydrating facial with extraction costs about NZ$100 and this takes about an hour or so. A 'complete' facial (that's how they lure you) with extraction and the whole sha-bang will cost you NZ$150 and above. The most expensive treatment only last for a maximum of two hours and this includes consultation time. Outrageous? You tell me. From where I come from, facials last for hours and hours, price starts at RM50 (basic facial with extraction) and you can 'top up' your facial with oxygen masks, collagen treatment, micro care treatment etc flexibly. The best part is, after your facial, you get a relaxing massage on your back and hands. It's just pure bliss. By the way, for those (like my hubby)who don't know what extraction means, it is the process of removing all the blackheads, whiteheads and other impurities in your skin. Nowadays, the price of beauty has skyrocketed and the cosmetic industry is raking in billions of dollars each year. It was reported that from 1993 - 2000, the trade in cosmetics among ASEAN countries soared from US$140 million to US$354 million (source: Association of Southeast Asian Nations). This figure tells me that nothing can stop a woman from wanting to look young and beautiful. Those pricey 'complete' facials cost a fortune but that doesn't stop women from visiting their favourite salons. Beauty experts come up with new, revolutionised treatments from time to time and women never fail to sample them. The focal point is, it is women's nature to be beautiful. End of story. 1. Sunscreen. Sun damage is the #1 cause of wrinkles. Wonder what your skin would look like if it was never exposed to the sun? Look at your bottom. Wrinkle-free, eh? That's what your skin would look like it it was kept under cover all the time as well. A good rule of thumb: If it's daylight outside, you need sunscreen, no matter how cloudy it is. In the June, 2005 issue of InStyle Magazine, Dr. Fredric Brandt, dermatologist to the stars, suggests using a 'two-finger scoop' of sunscreen daily to the face & neck. Also, don't forget the top of your hands. 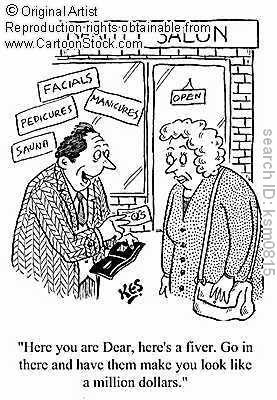 Dermatologists report seeing women with young faces & old hands all the time. 2. Vitamin A (retinoid) creams. To prevent wrinkles or keep them from worsening, look for products containing vitamin A like prescription Retin-A, Differin or Renova. Used nightly (or every other night), vitamin A creams stimulate collagen renewal & prevent skin cells from breaking down. Women in their 20s & early 30s can use these to keep fine lines from turning into deeper furrows. I've been trying one percent Retin-A on my skin for the past month & I've noticed a marked improvement even though best results can be seen in about 6 months. (Just make sure you never go out without sunscreen when you're on these Vitamin A products, your skin is extra susceptible to sun damage). Don't want to go to a doc? A great over-the-counter anti-wrinkle product is RoC Retinol Actif Pur Anti-Wrinkle Treatment. Matrixyl is a newer ingredient that is becoming very popular and is touted as being great for sensitive skin. 3. Alpha-hydroxy acids or microdermabrasion. If you're in your mid-30s & worried about wrinkles you might try exfoliating once a week with a alpha-hydroxy acid (AHAs) or a microdermabrasion kit. Don't use both & be careful not to over-exfoliate. Chemical exfoliators (the AHAs) work great on oily or combination skin, while the physical scrubs (microdermabrasion) are great for very sensitive skin (make sure it's in a creamy base). AHA's are glycolic or lactic acid formulated to increase collagen in sun-damaged skin. They are also known to reduce pore size, redness, blotchiness & fine lines. Microdermabrasives smooth fine lines & get rid of dead skin. I've tried several kits & like Dr. Brandt Microdermabrasion In A Jar. I also like Lancome's RESURFACE-C MICRODERMABRASION Resurface-C Microdermabrasion Kit. A less expensive, but still excellent option, is L'Oreal ReFinish Microdermabrasion Kit. 4. Antioxidants. Free radicals -- the unstable oxygen molecules produced by pollution, stress & sun -- are a skincare nightmare. They attack healthy skin cells & cause collagen breakdown, all of which lead to wrinkles. Antioxidants like green tea, vitamins C & E, & coenzyme Q10 work together to neutralize free radicals. A cocktail of these antioxidants are like a multi-vitamin for skin, according to dermatologist Dr. Dennis Gross. The most popular antioxidant on the market right now is prescription Prevage, a cream that is made with idebenone, a synthetic antioxidant & 'star chemical' dermatologists swear by. Another excellent (over-the-counter) option is Skinceuticals C E Ferulic serum, which clinical studies show reduced sunburned cells by a whopping 96 percent. Elizabeth Arden's Prevage Anti-Aging Treatment also gets high marks from dermatologists.